The currency has defied its critics, but lack of supply-side reforms threatens its future. The euro celebrates its 20th birthday on Jan. 1, and more than most such milestones this one is a major accomplishment. The creation of the monetary union stands as one of the most consequential events in postwar Europe, along with the creation of the Common Market, the collapse of the Soviet bloc and the reunification of Germany. The euro’s durability is all the more remarkable given the demands it places on its members in return for a promise that remains only partly fulfilled—a fact that has bedeviled the currency’s first two decades and could still tear it apart. Those goals have largely been met, as has Mr. Mundell’s coda that another euro benefit would be continent-wide monetary policy “run by the best minds that Europe can muster.” For all the debate over Mario Draghi’s post-panic interventions in particular, the European Central Bank has delivered more responsible monetary policy than many Europeans could count on from their pre-euro central banks. The euro also has checked some of the economics profession’s worst ideas. Mr. Mundell and a handful of others argued from the start that the euro would preclude the devaluations by which Keynesian economists seek to paper over their failures at the expense of savers and the poor. Economists and columnists who should know better still claim the euro’s fatal flaw is that struggling economies can’t devalue their way back to prosperity. Voters in Europe’s shakiest economies understand that this is a benefit not a cost. Greeks have good reasons to chafe at Brussels-directed economic mismanagement. But in the depth of their crisis in 2015 they were eager to send their euros abroad to protect their savings from a threatened reintroduction of the drachma. No one has built a political consensus to leave, even amid the rise of populist and nationalist forces. Some 85% of Irish, 64% of Portuguese, 62% of Spanish and 60% of Greeks said in the November issue of the European Commission’s Eurobarometer poll that the euro is good for their countries. This is astonishing support in countries that have suffered so much to keep the currency, and it is mirrored by strong support in countries whose beleaguered taxpayers undergird the union. Seventy percent of Germans think the euro is good for Germany, and 69% of Dutch say the same for the Netherlands. Support for the currency is particularly strong among young Europeans. Yet the politics of the euro remain complex. Many of the euro’s founders hoped that sharing a common currency would encourage Europeans to think of themselves as sharing a common European polity. Economic integration would demand an ever closer political union, and both would enhance Europe’s global power and prestige. Other euro supporters hoped the common currency would spur supply-side reforms that were overdue 20 years ago. Neither camp has been entirely right. We and others hoped that with competitive devaluation no longer an option, governments would have to deregulate, cut taxes and reduce spending to let domestic productivity converge with the euro’s strongest members. Early on it seemed to work, especially when Germany implemented labor-market reforms in 2003-04 and shed its reputation as the sick man of Europe. But this optimism underestimated how reform-averse Europe can be. Countries honored national deficit targets in the breach, while less competitive economies like Greece took advantage of low euro-borrowing rates to live beyond their means. Since the eurozone crisis that kicked off in Athens in late 2009, neither Brussels nor most national capitals have pursued the policy reforms they need to restore pre-crisis prosperity. The result is a eurozone whose economy grows too slowly during global booms and seems less resilient to every new global slowdown. Extraordinary monetary experimentation from the ECB over the past decade bought more time for its lagging members. Yet Mr. Draghi’s repeated calls for supply-side reforms to put the eurozone on a more stable footing have gone largely unheeded except, belatedly, in Emmanuel Macron’s France. And Mr. Macron’s reforms are now in jeopardy after the uprising against his fuel tax. This uneven distribution of the costs of reform exacerbates political tensions between members. Germans who accepted less welfare and modest wage increases as the cost of longer-term competitiveness chafe as Greeks try to use German subsidies to avoid those costs themselves. Italians who see Mr. Macron get a pass for violating eurozone fiscal rules with pro-growth tax cuts refuse to accept they don’t warrant similar forbearance for a new welfare binge. The temptation is to view this as an institutional problem to be solved perhaps by creating a eurozone finance minister or doubling down on hasty political integration. Mr. Macron has made this the centerpiece of his European agenda and even a growing number of German economists seem to think some form of fiscal union will have to happen. Many politicians also want new bailout funds or fiscal transfer mechanisms. But Europe is still composed of nation states with individual traditions and politics, and there is no consensus for such political integration. In any case the main promise of the euro was always economic—to promote free commerce and impose policy discipline. The lesson of the euro’s first 20 years is that only economic reform to boost growth and productivity in lagging members can allow the euro to live up to its full potential. A glut of unwanted apartments gets part of the blame for a slowdown in the world’s second-largest economy. In some places, homeowners are taking to the streets. JURONG, China — For Hu Peiliang, Jurong was a city of cranes, concrete and opportunity. He was so sure it was on the cusp of a boom that last year he moved his family there. On an overcast day last month, Mr. Hu, a 31-year-old real estate agent, pointed to one new building after another as evidence. New city blocks have been built, crosswalks and streetlights erected overnight. One development straddling several blocks called Yudong International will include 120 buildings when completed. But who will buy all those apartments? Mr. Hu paused before answering. “I was wondering that myself,” he said. Since July, he has sold only a handful. Unwanted apartments are weighing on China’s economy — and, by extension, dragging down growth around the world. Property sales are dropping. Apartments are going unsold. Developers who bet big on continued good times are now staggering under billions of dollars of debt. “The prospects of the property market are grim,” said Xiang Songzuo, a senior economist at Renmin University, said during a lecture at Renmin Business School this month. “The property market is the biggest gray rhino,” he said, referring to a term the government has used to describe visibly big problems in the Chinese economy that are disregarded until they start gaining momentum. China is grappling with an economic slowdown brought on by efforts to curb debt and worsened by the trade fight with the United States. But any solution will have to contend with the country’s property problems. More than one in five apartments in Chinese cities — roughly 65 million — sit unoccupied, estimates Gan Li, a professor at Southwestern University of Finance and Economics in Chengdu. In places like Jurong, homeowners are paying the price. Some property developers have slashed prices on new apartments to gin up business or cut corners to save money. That undercuts the property values of earlier buyers, who increasingly are taking to the streets to protest. In October, dozens of apartment buyers in Jurong gathered outside the sales office of Center Park, a 22-building residential complex pitched by Country Garden, the developer, as China’s version of Central Park in Manhattan. Security guards barricaded the entrance to prevent protesters from storming the building to demand their money back. “I am very angry,” said Jia Rui, 24, who bought a Center Park apartment a year ago. He watched last year as property prices rose for months before deciding to buy the apartment, which will be bigger than the one he currently lives in with his wife and parents. When he learned that similar apartments were later being sold at nearly half the price, Mr. Jia said, he felt helpless. “It is not possible to get a refund,” Mr. Jia said. Then again, he added, Jurong will have a subway line connecting it to Nanjing, a major city, by 2023. “Maybe the price will go back up by then,” he said. China’s property market has long been a wild ride, driven by speculation from property developers and home buyers alike and made worse by government efforts to tame prices if they get too high and juice sales if they get too low. The current slowdown stems in large part from a three-year building spree driven by a surge in prices in many cities. Officials struggled to contain a white-hot property market with measures that included open consideration of a national property tax. Housing is key to China’s well-being. It accounts for roughly one-fifth to one-third of China’s economic growth, depending on whether ancillary industries like construction and furniture-making are included. Property is the largest source of wealth for households, a given in a country with strict rules against moving money overseas and a volatile stock market. In major cities, it sometimes accounts for as much as 85 percent of a family’s assets, according to researchers at Southwestern University. That store of wealth is looking increasingly shaky. Sales in terms of gross floor area on the market have dropped sharply since September. The share of apartments in new developments that are being sold has plunged since the summer. The number of failed land auctions has doubled this year, indicating that property developers are unwilling or unable to buy land for new developments. Now people are angry, and Chinese officials and property developers are doing something about it. Officials tried various measures to take steam out of the market last year and are now reversing some of them. In recent months, they have loosened mortgage requirements, eased restrictions on when homeowners can resell their properties and made it easier for university students to continue living in the cities where they are studying after they graduate, potentially increasing housing demand. In some cities, property developers have cut deals with home buyers to give them back the difference between the current price and the one they originally paid. As housing prices begin to fall — in some cities by as much as they did during the depths of the global financial crisis in 2009 — some buyers have made their displeasure known. Jurong, a small city by Chinese standards of 600,000 people about a 45-minute drive from Nanjing, has experienced at least six protests alone in recent months. Jurong represents a bet by home buyers that a buoyant market in Nanjing, a former Chinese capital and one of its more picturesque cities, will spread to surrounding areas. Many home buyers are retired workers or farmers who have moved to the city from the surrounding countryside. Today the city appears to be preparing for a future in which its population more than doubles. There are 19 other projects like Center Park. Country Garden, the developer behind Center Park and other residential complexes around the country, has endured slumping sales and has slashed prices. It has faced fury from buyers, some of whom have taken to smashing in the windows of sales offices in at least one city, according to the local news media, which posted images and video. In a written statement, Country Garden said fluctuating home prices were “a normal market phenomenon” and said it would “make proper arrangements” to assuage angry home buyers. Hu Peiliang, the real estate agent in Jurong, and his friend Wang Liwei were selling homes in Nanjing before they decided to make the move to Jurong. If prices were so high in Nanjing, it seemed only logical to both men that prospective buyers who were unable to afford a place there — or who were locked out of the market because of residential restrictions — would look to Jurong. The government’s plan to build a metro system made the city even more appealing. At first they were right. In 2016, some 49,000 apartments were sold in Jurong, a remarkable number for a city where the annual average is closer to 4,000, according to Huifeng Li, a research director at the Purple Mountain Digital New Media Research Institute in Nanjing. The majority of the new buyers these days are speculators, he said. Hundreds of buildings sprang up, offering a glimpse of a future bustling city. Now, these partly constructed buildings have more of a ghost town feel. At the Center Park development site, green netting drapes over a dozen half-built apartment buildings, construction cranes on top of each. Men with white gloves stand at the sales office, from which soft jazz music is playing, waiting to greet prospective buyers. But there are few customers, and the greeters mostly look bored. At the back of the office, a dozen real estate agents sit around coffee tables and stare at their phones. - We zoom out for the year-end Marketplace roundtable to look at the macro environment. Does Q4 2018 foretell a shift? - There's consensus that the current economic cycle is drawing towards an end, but the Fed's exact role remains up for debate. - Bonds, emerging markets, and perhaps a last leg of the equity bull market stand out as possible directions to watch for in 2019. 2018 seems to be ending on the wrong note in the markets. December is setting the wrong kind of records, and Q4 has been a bumpy one in general. This is what happens in the stock market sometimes, but it's been easy to forget over the decade-long bull market. We're using the end of the year as a chance to lift our heads, survey the market, and see what might be coming ahead. To do so, we're inviting our Marketplace authors to do a series of roundtables. 2018 was another steady growth year for the platform, and we have a lot of great voices on the Marketplace, so we wanted to share their perspective with you. Our Year End Marketplace Roundtable series will run through the first full market week in January. We'll feature ten different roundtable discussions, with expert panels chiming in on Tech, Energy, Dividends, Other Income strategies, Gold, Value Investing, Small-Caps, Alternative investing strategies, Biotech, and the Macro outlook. Eric Basmajian: The biggest mistake the Federal Reserve made in 2018 was tightening monetary policy into a global and now domestic economic slowdown. The global economy empirically peaked in January of 2018 while the US economy peaked in Q2. In year over year GDP terms, growth actually peaked in Q3 for the US, but 75% of the third quarter gains were inventory and government spending, so the underlying economy peaked in Q2. When the economy slows, long-term yields fall. As the Fed tightened policy into a slowdown, long-term rates fell as short-term rates pushed higher, flattening and inverting parts of the yield curve. Inversions in the yield curve cause dramatic slowdowns in bank lending and shadow banking which manifests itself in the form of slower economic growth 2-4 quarters in the future. In 2019, the US economy will suffer the consequences of Fed policy in 2018; the slowdown has just started. Topdown Charts: Quantitative tightening has been the bigger, and up until recently, more underappreciated issue in my view. Add to that the tapering by BOJ & ECB and we've seen developed market effective/shadow composite rates up over 200bps vs. the some 90bps on a headline basis. Make no mistake, central banks are moving to become sources of volatility rather than supressors of volatility. Avi Gilburt: I do not view the Fed as significant as many others. In fact, as the Fed was expressing its intention to continue to raise rates, I was suggesting a long position in the TLT when we struck 113. Moreover, my minimum target over the next year or two is the 131 region in the TLT. So, no matter what the Fed does or does not do, I think the market will overpower the Fed when it comes to rates. SA: Where do you think the Fed or interest rates go from here in 2019 and beyond? Eric Basmajian: In the long run, interest rates follow the trending direction in growth and inflation. From 2016 to 2018, real GDP accelerated from 1.3% year over year to 3.04% (Q3 2018) which caused interest rates to rise across the entire Treasury curve. Now that growth and inflation have peaked and are decelerating, we can expect the Federal Reserve to back off future monetary tightening and for long-term rates to move lower as well. Interest rates across the Treasury curve will move lower, following the rate of change in growth and inflation. Topdown Charts: Expect ongoing QT and rate hikes next year, with a recommencement of QE when the next recession hits. Avi Gilburt: Over the next year or two, I expect rates to pullback. As I noted, I bought TLT at 113, and expect it to rally to at least the 131 region. SA: 'Late Cycle' was one of the phrases of the year in the market. Do you view that as an accurate description of the current market and economic cycle, and why or why not? Eric Basmajian: Yes. Currently, the US economy is in the "maturity" phase of the economic cycle. Early indicators that the economy has peaked include a slowdown in housing, auto sales, and durable goods consumption or "big-ticket" consumption. Those three specific sectors lead the economic cycle because they are large line items in the consumer basket and often require interest rate financing. As interest rates rise, these sectors are hit first, and then employment in the housing and auto industry slows, perpetuating the end of the economic cycle. We have seen a very notable decline in home construction, specifically building permits which are down 8% from their peak as well as auto sales. The next place this economic slowdown will appear is in the employment market, specifically in the average work-week length and aggregate hours. Once the slowdown appears in the employment market, we will be moving past "late cycle" and moving closer to the official end of the cycle. Topdown Charts: The big debate is as to whether we are late cycle or end cycle. I think late cycle, but I am closely monitoring a couple of key charts on a global level, which to be fair are flagging risks of a slowdown. Avi Gilburt: I view the stock market as having started its latest bull-cycle in 2009. And, since I utilize Elliott Wave analysis, wherein we view bull trends as taking shape within 5 waves. Currently, I see us as being within the 4th wave of that 5 wave structure off the 2009 lows. And, once we complete this 4th wave correction, I see a rally to at least the 3225SPX region in the years to come. That last rally will complete this bull cycle off the 2009 lows. SA: It's easy to over-dramatize the times we live in, so that 2018 seems like the most 'fill in the adjective' year ever. How does this moment in time compare to other market cycles or moments you have lived through or study? Are there lessons we can draw from history to guide us in 2019? Eric Basmajian: I take a less over-dramatized approach. Put quite simply, when the Federal Reserve tightens monetary policy during an economic slowdown, assets respond negatively. We can look at all the periods of Federal Reserve monetary tightening for a proxy on how this cycle will end. When growth is accelerating, as it did from 2016 to 2018, monetary tightening is relatively painless. As soon as growth starts to decelerate, monetary tightening becomes catastrophic. I am not referring to "strong" growth or "weak" growth; those are opinions. Accelerating or decelerating rates of growth are empirically measured facts. When growth is accelerating, the market can handle tightening. When growth is decelerating, as it is now, and the Fed is tightening, move out of the way. Topdown Charts: Sticking to recent history one thing I would highlight is how big a contrast the end of 2018 is to 2017: at the end of 2017 we saw increasing overvaluation across assets and markets, significant optimism on the markets and economy, and a sense of complacency. Right now, we have much cheaper valuations, increasing pessimism, and even signs of panic in some indicators. This contrast should make contrarians prick up their ears. Avi Gilburt: I believe that the market is fractal in nature. This means that these movements are variably self-similar at different degrees of trend. In other words, the impulsive and corrective movements of the market are occurring at all degrees and in all time frames. So, if one truly understands the underlying nature of the market, history is constantly repeating itself. SA: What was the big story or lesson learned for you in 2018? Eric Basmajian: Significant increases in government spending cannot change the economic cycle but can prolong an acceleration phase or delay the transition into the latter stages of an economic cycle. The global economy peaked in Q1, as the US economy should have. Massive fiscal spending, captured in the GDP report, delayed the slowing of US GDP for two quarters and had a more substantial impact that was initially thought. This delayed the decline in long-term interest rates that we are currently seeing that should have more than likely started when the rest of the world peaked in Q1. Topdown Charts: Pay attention to the charts, and be constantly on a mission to improve and expand your analytical process. I missed or was slow to change on a couple of things (opportunity to improve), but managed to get ahead of and nail several market calls on the back of a chart/data driven process. That and don't count out the macro picture! SA: What are you preparing for in 2019? Any big themes to watch out for? Eric Basmajian: I am preparing for a continuation of the deceleration in domestic economic growth. Growth in Q4 will be lower than Q3 and the first quarter of 2019 will show headline inflation below 2% and economic growth significantly slower than 2018. Asset prices will respond negatively at the start of Q1 to decelerating rates of growth and inflation. Topdown Charts: Looking forward, the theme of “transitions” I think captures a lot of the major moving parts: a transition for central banks from suppressors to sources of volatility, rotation across assets and markets, and a transition stage in the business/market cycle. Risk is clearly elevated, but so too is opportunity. Avi Gilburt: I am looking for a continued rally in bonds, whereas I am also preparing for the opportunity to move back into the stock market. In August and September, I began to "emotionally" prepare my subscribers for the stock market topping out and beginning a 20-30% correction. And, when the S&P500 broke 2880SPX, I noted that I was moving to cash. I am looking for the opportunity to get back into the market in 2019 for the last phase of the bull market which should take us up to at least the 3225SPX before the bull market which began in 2009 completes. SA: What's your favorite idea to have in your portfolio or to position your portfolio, and what's the story? Eric Basmajian: Investors should continue to position defensively relative to their asset allocation strategy. The best idea is long-term Treasury bonds. Long-term interest rates follow the trending direction in growth and inflation, and with economic trends moving lower, long-term bonds will gain. Don't let bonds fool you. There can be massive capital appreciation with bonds too. As a reminder in 2014, long-term bonds, expressed through ETF (EDV), rose 45%. Topdown Charts: The stars are aligning for emerging market equities, particularly relative to developed markets. Valuation, sentiment, technicals, and cycle indicators are all coming together to create a potential stellar year or even couple of years for emerging markets. Though they have taken a lot of pain this year, that's actually been a key part of the setup. I also like commodities and China A-shares for similar reasons. “YOU ARE on dangerous course,” barked a Chinese sailor aboard the Lanzhou, a destroyer, over the ship’s radio on September 30th. “If you don’t change course you will suffer consequences.” The vessel picked up speed and overtook the USS Decatur, an American destroyer, which was conducting a “freedom of navigation operation” (FONOP, in Pentagon jargon) near reefs in the South China Sea that are claimed by China, the Philippines and Vietnam. “We are conducting innocent passage,” insisted the Decatur. She sounded five short blasts with her whistle as the Lanzhou closed in, passing within a hair-raising 41 metres. “They were trying to push us out of the way,” notes an American sailor, narrating a video of the incident. Had the Lanzhou misjudged and smashed into the Decatur, lives might have been lost. If the ships had collided, how would the two countries have responded? There have been several such nail-biting encounters between Chinese and American ships and aircraft. The record has not always been reassuring. James Fanell has not forgotten a moment in 2009 when he was director of intelligence for the Seventh Fleet. He was told that Chinese vessels had surrounded the USNS Impeccable, an unarmed American survey ship, in international waters near China’s Hainan island. The Americans feared a repeat of what happened to the USS Pueblo, a vessel that was seized in 1968 by North Korean forces. In 2001 an American aircrew had been detained for 11 days on Hainan after their EP-3 spy plane had collided in mid-air with a Chinese fighter jet and made an emergency landing on the island. “Are we prepared for the Chinese to board?” asked an American admiral as he worked to manoeuvre other ships close to the Impeccable. The standoff was ended, says Mr Fanell, by an American diplomat in Beijing who was alerted while cycling through the city on a Sunday. He dashed back to the embassy and managed to raise his Chinese contacts who, luckily, proved to be useful ones. Ten years after the Impeccable incident, American and Chinese ships and aircraft are at even greater risk of closer encounters in and over Asian waters. China has been building islands on contested rocks in the South China Sea and turning them into military outposts. America has stepped up its FONOPs. The two countries’ armed forces remain woefully ill-prepared to defuse any unexpected crises or to avoid misunderstandings that might arise from military movements. Relations between the Chinese and American defence establishments are not as rocky as they once were. It used to be that communications were routinely broken off just when they were needed most—during crises such as those over Taiwan in 1996, America’s bombing of China’s embassy in Belgrade in 1999 and the EP-3 incident in 2001. Since then there have been fewer disruptions. This is partly because there have been fewer flare-ups on such a scale. But the two armed forces have also been trying harder to keep their relations steady. After Xi Jinping became China’s leader in 2012 he stepped up the country’s push into the South China Sea. But Mr Xi also ordered officers to strengthen ties with their American counterparts. That led to some important agreements. 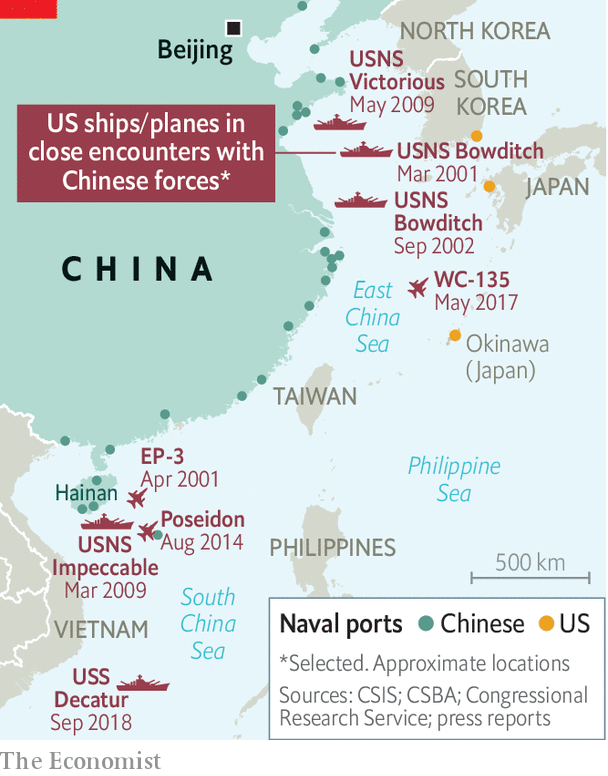 In 2014 the two countries endorsed a Code for Unplanned Encounters at Sea (CUES) which China had previously rejected. Memos exchanged in 2014 and 2015 laid down clearer rules for aircraft and ships operating close to those of the other country. Among other things, these discouraged pilots from making “unfriendly physical gestures” from their cockpits. Dangerous intercepts of American aircraft by Chinese ones, common between 2011 and 2013, became rarer by 2014. “Encounters between our forces at sea and in the air are generally safe,” said Admiral Harry Harris, then America’s military chief in Asia, last year. But the Decatur’s close call showed that perils persist. One mechanism for reducing them is the Military Maritime Consultative Agreement, reached two decades ago. It has provided a forum at which mid-ranking officers can explain their version of incidents that have occurred. Some American officials complain that China uses these occasions to recite political talking points. But most of them say that the agreement plays a valuable role. For more urgent problems there is the Defence Telephone Link, established in 2008. This is not a hotline, says Roy Kamphausen of the National Bureau of Asian Research, a think-tank, who previously served as an American military attaché in Beijing. Rather, it is an “I’ll get back to you as quick as I can” line. The protocol for using it was streamlined in 2015, but American and Chinese officials still fax each other requests and pre-arrange calls, a process that can take days. The two military systems face more fundamental obstacles in their efforts to communicate. America’s approach, says Mr Kamphausen, is to build trust from the bottom up, whereas for China “trust is earned at the top and conveyed downward.” And even if the head of America’s Pacific Fleet could parley instantaneously with his Chinese counterpart, other steps would be required to defuse a crisis since a Chinese navy chief cannot proceed without the approval of a political commissar, who in turn may have to consult others. Getting to know each other better may be even trickier in these times of tension over trade and other matters. 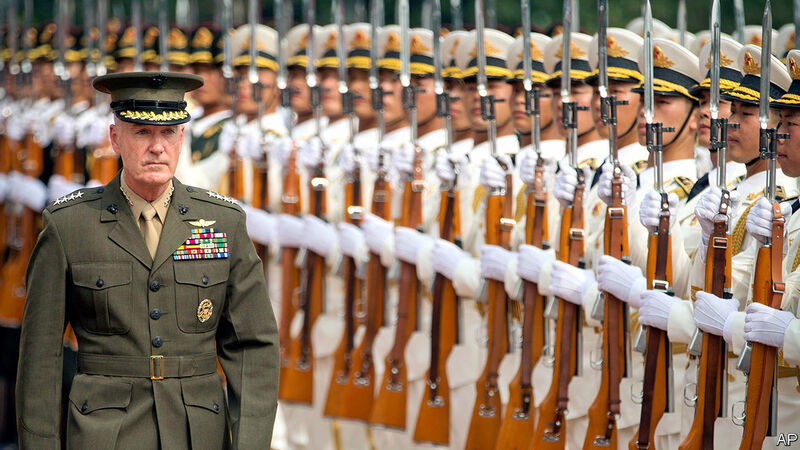 Last year General Joseph Dunford, chairman of America’s Joint Chiefs of Staff, travelled to Beijing (see picture) and launched what was intended to be a regular gathering of senior generals, the Joint Staff Dialogue Mechanism. But it did not reach its second birthday. China called off this year’s meeting in a huff after a row over American sanctions on a Chinese military unit involved in importing arms from Russia. Drew Thompson of the Lee Kuan Yew School in Singapore, a former head of the Pentagon’s Asia desk, recalls being told that military-to-military talks with China were like watching paint dry. “I discovered that it’s more like Chinese lacquer, putting layer upon layer. Eventually it’ll be something beautiful. But the process can be slow and painful,” he says. Another crisis may erupt long before it is complete.